So i have decided to do an overview of all the places we have traveled to on our grand adventure, now that it's coming to an end! Spain was really so much fun. Shan and i were not thrilled with madrid, but once we got out of there things start to look up for us. San Sebastian was so much fun, and really laid back. All we did was lounge about on the beach and wander throughout the little town getting some pictures, and we also met up with my friend Kaitlyn, who had been doing a study abroad in spain. It was so much fun seeing her and hanging out with her friends from the program. 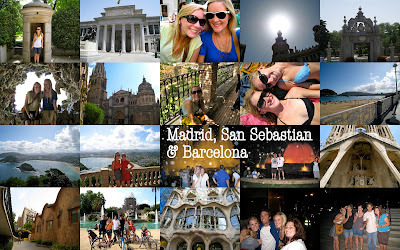 After San Sebastian, we took a 10 hour train ride to Barcelona. Barcelona was amazing. We loved it. We met up with Nate and Blake there, and that's when the party began. We were constantly doing something. We went to the beach, we went to the sagrada familia, park de guell, the boys took us on a bike tour throughout the city, and we went out dancing the night away. We also saw Kaitlyn while we were in barcelona, which made it really fun cause we then had a big group of about 6-8 people! all in all, barcelona was a marvelous experience! sounds like a great time was had by all..